BleachHouseLibrary.ie: #IrishFictionFortnight - Day 6 - "The House Where It Happened" by Martina Devlin. Signed copy to Giveaway. 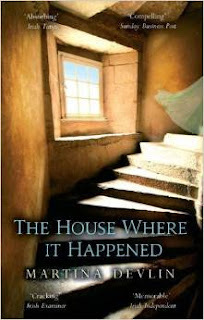 #IrishFictionFortnight - Day 6 - "The House Where It Happened" by Martina Devlin. Signed copy to Giveaway. Thanks to Martina Devlin there is a signed copy of her historical fiction title, The House Where It Happened, up for grabs for one lucky #IrishFictionFortnight reader. Although I have this book in my TBR pile since it was published, I have yet to read it. However, I went to see Martina give a wonderful talk about the book, and its origins in Irish history, at the Hay Festival in Kells, Co. Meath. She had me, and the rest of the audience, enthralled and made the book come to life. The story is fascinating and as I have read other titles from Martina I can safely say, with certainty, this girl can write! I am lucky enough to have read an ARC of her upcoming novel, About Sisterland, and while I can't review it just yet, I will tell you it is in a completely different direction and blew me away... Just enter via rafflecopter link below for your chance to win this signed novel. Good Luck! It is 1711, and the Ulster-Scots community in a remote corner of Ireland is in turmoil. A pretty young newcomer is accusing one woman after another of witchcraft. But Ellen, the serving girl in the house where the visitor is staying, is loyal to the family - and over-fond of her master. Yet she knows that Knowehead is a house like no other. And so she watches and ponders, as a seemingly normal girl claims she is bewitched - as a - community turns against eight respectable women and as malevolent forces unleashed more than half a century earlier threaten a superstitious people beyond their understanding. Martina Devlin has fictionalised a compelling episode from history, transforming it into a spine-chilling tale. Martina Devlin is a bestselling author and award-winning journalist. She has had eight books published including the number one best-seller Banksters, a co-authored account of the Irish banking collapse written with RTÉ's David Murphy. Published in September 2014, Martina's latest book is The House Where It Happened, a novel inspired by a true story. Other work includes Ship of Dreams, a novel about the Titanic – inspired by a family connection with the disaster – and a memoir,The Hollow Heart. She started writing fiction after winning a Hennessy Literary Award for her first short story in the 1996, and has been shortlisted twice for the Irish Book of the Year awards. A former Fleet Street journalist, she writes weekly columns for theIrish Independent, and contributes essays to RTÉ Radio 1’s Sunday Miscellany. In 2013 she joined the board of the Irish Writers Centre. In 2012 she won the Royal Society of Literature's VS Pritchett short story award. In 2011 she was named National Newspapers of Ireland columnist of the year. In 2010 she was GALA columnist of the year. In 2009 she was writer-in-residence at the Princess Grace Irish Library in Monaco. Martina has an MPhil in Anglo-Irish Literature from Trinity College Dublin. She was born in Omagh and lives near the sea in Dublin. The House Where it Happened is published by Ward River Press and is available in paperback and ebook format. Liz Mc Mannus. I have to admit I didn't know tha answer and had to look it up. I think I'm probably missing outon some great books so thanks for bringing them to my attention and for the chance to enter. Eoin C Macken (I'll admit to having to look up the authors).